I had a spare moment to lay my rug down and photograph the progress of the hit and miss border. When you are working on a big piece, it is always helpful to lay it out every once in a while and step back and take a good look at it. I am very happy with the way the border is turning out and I don't see anything that needs adjusting so I am going to keep hooking! I love the way the small stripes have given this design a lively twist. The colors also pull your eye out to the edge of the rug. For the mix of colors, I used all the colors that were used in the center design, plus added a few more that weren't used at all but blend nicely with the overall color plan. I look forward to sitting down at my frame every night and working on the border...I always want to see what the next color will look like as I hook in the stripes. A Happy Day And New Patterns! Thanks to all of you who came out for the BSSG Market Day & Fiber Fair in Bowling Green Ohio yesterday. We had a really fun day and it was great to see familiar faces and new shoppers. At one point during the day, I looked up and saw quite a crowd of people and overheard someone say "looks like the recession is over!" Despite the cool weather, the sun was shining and I think that is enough to raise one's spirits. 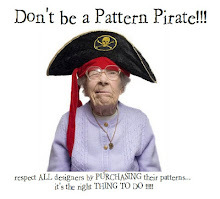 If you haven't been to my website recently, I do want to tell you that there are a few new patterns added. The Notforgotten Farm collection has three delightful new patterns. You can see them at the top of the page. I love all of them but I just wanted to point out that the Daisy pattern is a really wonderful pattern for all you "wide-cut and primitive" fans out there. Also added is 6 new magical and dreamy adaptations from Ann Willey's designs. The new patterns are again listed at the top of the page. There are some great animal designs (check out Little Fox!) and two "girl" patterns that can be embellished in so many ways. I immediately thought of some colorful Sari ribbon (did you know that Spruce Ridge Studios carries a beautiful selection of Sari ribbon all the time?) and I think some funky yarns or quillie circles would work too. Lastly, there are a few delightful patterns in The Cooperage section. There's a really cute Gingerbread Men pattern that can be hooked as a small bag or a square mat. I'm not sure that I've seen any Gingerbread Men rug hooking patterns out there so I think this one is really special. I have been working more on my hit and miss border. It is quite a long runner but I almost up to the third corner. I will post an update as soon as I can get a new photo. Just a reminder that I will be vending in Bowling Green, Ohio this week-end! 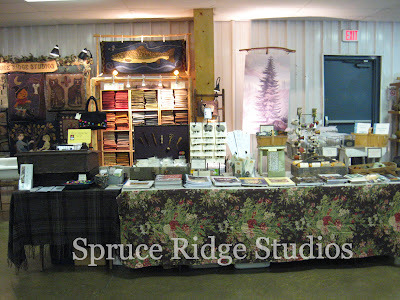 Quality fiber-related products such as rug hooking supplies, yarns, roving, fleeces, spinning and weaving supplies, handcrafted items, books, dyes, and more. Door prizes and lunch is available. It's my first show of the year and I've got lots and lots of wonderful treasures just waiting for someone to buy! It may be chilly outside but the warm fuzzy fiber will make you feel good on the inside. This is a cute little show just crammed with all kinds of unique products for the fiber lover and artist. Thank you for all your kind words about Sequoia. I feel better today and I know he is reunited with his brothers in the green pastures of heaven. On Saturday, I lost one of my dearest friends, Sequoia. He was part of the original three goats that started me out on this wonderful farm journey. He was 13 years old and was very frail in the last few weeks of his life. I pampered him and babied him and I know he had the best life possible here. My heart is so sad but also so grateful for the good times, laughs, and companionship he provided. One winter, my son made a snow goat for Sequoia! Oh, how these woolly kids get wrapped around my heart! What's on my frame? The answer is an adaptation of an antique runner. I am crazy in love with the colors of the original, so I have tried to work up the same color plan. Yowza! Nothing is better to me than the turquoise blue and coral colors! As you can see, I only have one small corner portion to finish up and then I will be moving on to the border. 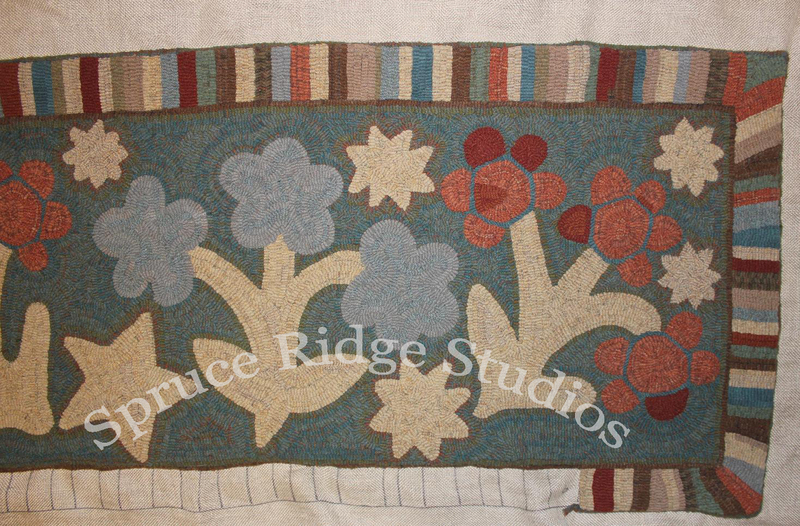 The wide hit-and-miss border will pull all the colors from the main design out to the edges...plus I will be adding just a few other soft old colors and a bit more brown out there too. I started this rug at the beginning of the year and have put it aside several times to work on some smaller projects. I find that this is one of those rugs that practically hooks itself and when I am not working on it, it calls to me to sit down and pull up a few loops. Have you ever had a rug do that to you? It's quite a long runner...I had to stand on my sofa to get both ends in the picture! 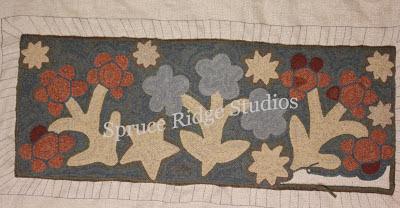 I'll be adding this pattern to my pattern line once it is completed. It's a very fun design to hook!